I have recently purchased a few "marriage" watches, which are vintage pocket watches which have been made into wrist watches. They are almost all from the Ukraine, and include many Omega, IWC, Hamilton, and also some Pateks and Rolex. Many are truly one of a kind, as they are in amazing condition for 100 year old pocket watches that were not made in large quantities and were now converted into wrist watches. Many watch collectors consider them to be "abominations", but I love the ones I have. Do any of you have experience with them? That could be due to the market having several iterations which are simply not well done. Also, purists may scoff at the history of them being messed with. When masterfully created, I find them to be very fun and unique. I've had my eye on the lookout for something done right. In the end, I may have a master jeweler create something for me for fun wear at parties etc. uhhh I think you're referring to what watch folk call "Frankenwatches" as in "Frankenstein" as in a vintage watch without its original parts, replaced with either fake or completely different components all together. "Marriage" is quite the optimistic word to use to describe fake vintage watch. It'd could probably be pushed as "one of a kind art" if these "art pieces" were produced anywhere other than Ukraine and India. No. That's something completely different. Very nice! Hard to tell from the photo - Is that 18K or Stainless? I just ordered a Jack Mason Aviator with a steel bracelet. What I really want is an IWC Mark XVIII or a Tudor, but this watch will do me until I get some debts paid off. Never heard of that brand but just checked it out. That's a nicely done pilot design. Hamilton has some nice pilots around that price point as well. I feel your pain about holding off on a purchase. I'm currently making myself hold off on a Glashutte Panomatic Lunar but I WILL have it. Gorgeous design. Good luck! Glashutte makes some beautiful watches. Le Petit Prince version or the black dial? I like the Le Petit Prince much better. Every time I tried on the black dial, it just looked so drab in person with all brushed surfaces that I never ended up buying one. I think IWC has one of the best blue dial colors on the market, but Breitling's new Navitimer 8 with it's bezel and date positioning has my interest. Tough decision. Does the 40 mm come in blue? I was wondering if you wanted the blue or black dial IWC. The Breitling's are 41mm, the IWC's are 40mm. Blue and black available in both sizes. Thanks. I guess I’d have to see them both in person. I do like the IWC better. I hear that. Depends on the watch I think. I went in the Glashutte boutique in Paris to try on the Glashutte Panomatic Lunar varieties. I actually preferred the white dial as opposed to the blue because the blue seemed a little bit of a novelty look. Which is fine for me in the 1k to 3k segment, but 5k to 10k I prefer to look for more classic colors I guess. I'd definitely go with the petite prince in the use case you mentioned though. That’s really how I feel about blue. I have a blue Gucci, but in a high dollar watch, I really think I’d want black for versatility. 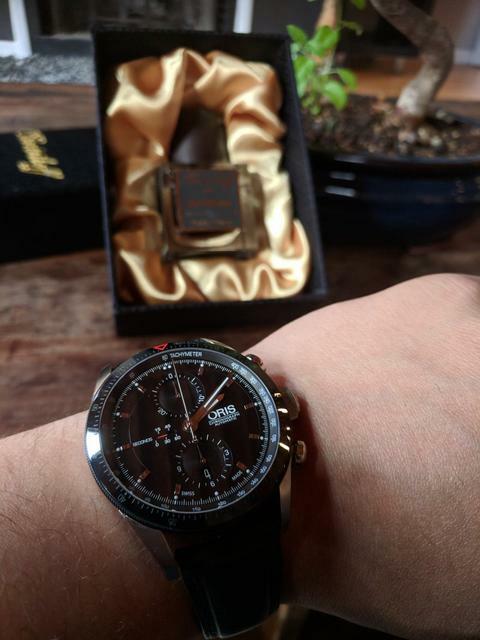 I have been collecting watches for years, but just recently I have been buying "marriage" watches. These are primarily from the Ukraine and are vintage pocket watches that have been made into wrist watches. Purists often regard them as an "abomination", but many are one-of-a-kind. The number of any one high end pocket watches from the early 1900's that are still in excellent physical and running condition is small and the conversion pieces are indeed unique. I just bought a Patek and a Rolex and will try to post pictures when they arrive. I'm in the "abomination" crowd due to this statement "I just bought a Patek and a Rolex". You didn't buy a Patek or a Rolex. Likewise, putting some old Ferrari engine parts in a Pontiac Fiero and slapping a horse emblem on the hood doesn't mean you bought a Ferrari either. If you like what you bought, that's great, but trying to pass them off as the real deal is just wrong. The Patek and Rolex pocket watches are all original parts. The only added parts are the wristwatch attachments. I think you haven't read his post carefully enough. I read and understand it. I am very familiar with the subject. Having collected watches for decades, I've watched (pun intended) the subject of these watches from the Ukraine come over and over on the watchuseek, rolex, and omega forums. You guys bring up an interesting topic. What is original? Using the Ferrari analogy, if I bought a new one and over time replaced parts from dealership do I still have a Ferrari? Most will say yes. If instead I went a generic mechanic and used generic parts, do I still have a Ferrari? Some may say no. I guess same with watches. What defines a watch ? Parts inside, strap, case, or a combination thereof. If you really did understand you wouldn't have made that Ferrari comparison. Do you really think changing a chain to a wristband renders the watch abominable and 'not the real deal'? The only "unoriginal" parts are the strap and 'hinges' (or whatever it's called) it's attached to. It's like saying my Bentley is fake and abominable because I changed the leather on the seats. I’m guessing you don’t understand that they didn’t take a complete Patek pocket watch and weld lugs onto it so they could attach a strap to it. They never had the complete pocket watch. They just take part of an old movement and put them in cheap newly made wristwatch cases that are large enough to fit a pocket watch movement. It not even a pocket watch case. They even admit that the dials aren’t original. They are fake reproduction dials. You can literally go on eBay right now and see them for yourself. If they had the original pocket watch, they could sell it for 4x the price of these wristwatches they are creating. Oris is a nice brand. Sometimes watches like yours pictured have too much going on and are too close for me to easily tell time. That's a big no no for me. A watch has to be able to do its primary job well. Yours is easily legible the way the hands are colored. And I like that Oris puts a full length hand on the watch instead of shorties. Very nice watch! My previous comment was towards the above post. Sorry for any confusion. Any brand suggestions under 150$?